Abstract. The analysis in nonlinear variational data assimilation is the solution of a non-quadratic minimization. Thus, the analysis efficiency relies on its ability to locate a global minimum of the cost function. If this minimization uses a Gauss–Newton (GN) method, it is critical for the starting point to be in the attraction basin of a global minimum. Otherwise the method may converge to a local extremum, which degrades the analysis. With chaotic models, the number of local extrema often increases with the temporal extent of the data assimilation window, making the former condition harder to satisfy. This is unfortunate because the assimilation performance also increases with this temporal extent. However, a quasi-static (QS) minimization may overcome these local extrema. It accomplishes this by gradually injecting the observations in the cost function. This method was introduced by Pires et al. (1996) in a 4D-Var context. 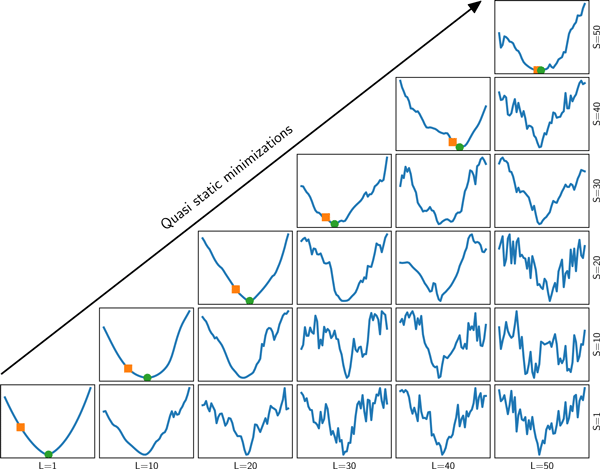 We generalize this approach to four-dimensional strong-constraint nonlinear ensemble variational (EnVar) methods, which are based on both a nonlinear variational analysis and the propagation of dynamical error statistics via an ensemble. This forces one to consider the cost function minimizations in the broader context of cycled data assimilation algorithms. We adapt this QS approach to the iterative ensemble Kalman smoother (IEnKS), an exemplar of nonlinear deterministic four-dimensional EnVar methods. Using low-order models, we quantify the positive impact of the QS approach on the IEnKS, especially for long data assimilation windows. We also examine the computational cost of QS implementations and suggest cheaper algorithms. 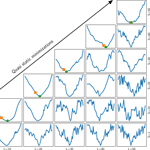 How to cite: Fillion, A., Bocquet, M., and Gratton, S.: Quasi-static ensemble variational data assimilation: a theoretical and numerical study with the iterative ensemble Kalman smoother, Nonlin. Processes Geophys., 25, 315-334, https://doi.org/10.5194/npg-25-315-2018, 2018. This study generalizes a paper by Pires et al. (1996) to state-of-the-art data assimilation techniques, such as the iterative ensemble Kalman smoother (IEnKS). We show that the longer the time window over which observations are assimilated, the better the accuracy of the IEnKS. Beyond a critical time length that we estimate, we show that this accuracy finally degrades. We show that the use of the quasi-static minimizations but generalized to the IEnKS yields a significantly improved accuracy.